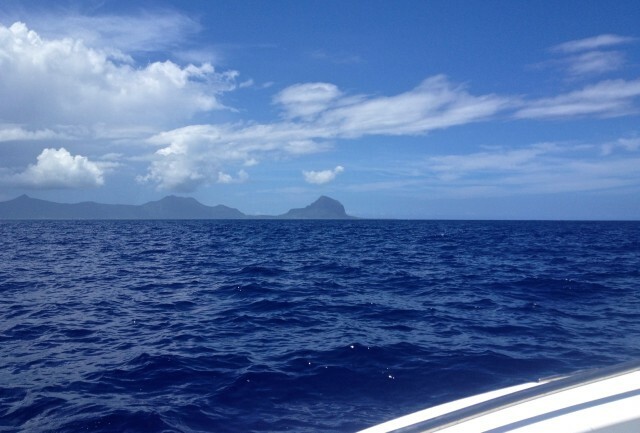 From November to May in Mauritius is marlin fishing season. February and March is the peak season. Every day fishermen pulling out a huge marlins, reaching up to half a ton of weight. 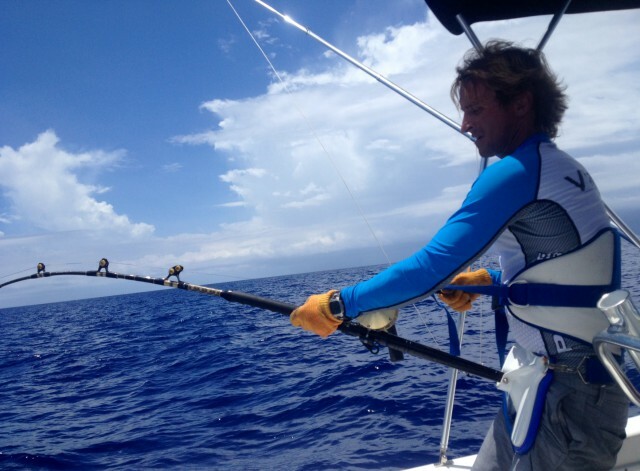 Co-owner of the kite school in Mauritius Pryde Club Eugene Novozheev (Jackson) known not only for his achievements in kitesurfing, such as crossing the Bering Strait under the kite, but also a great passion for fishing. 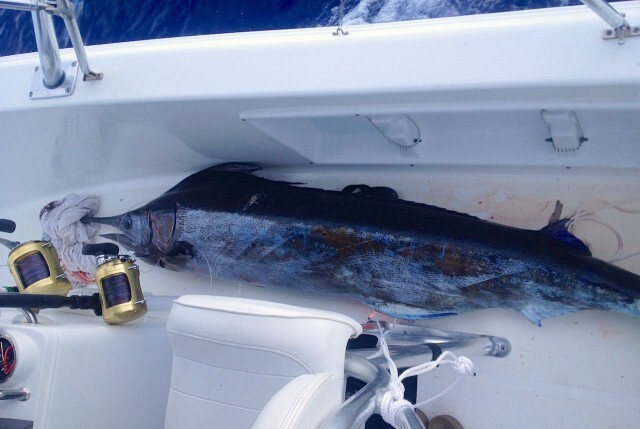 Jackson’s dream, like any avid fisherman, of course, to catch the world’s largest marlin. Marlin is not just the fish, it is a legend, praised by Ernest Hemingway in the world famous novel “The Old Man and the Sea“. 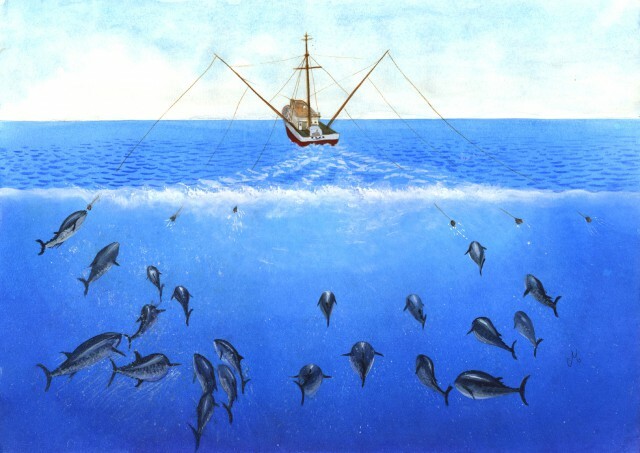 This work colorfully tells about confrontation, full of drama, between an experienced fisherman and a giant marlin. The old man took a few days to finally win a gigantic big fish that was so strong that it dragged a small boat in the open sea. Since writing this literary masterpiece in the middle of the last century, all, of course, has changed. To marlin fishing specially equiped boats are used now. 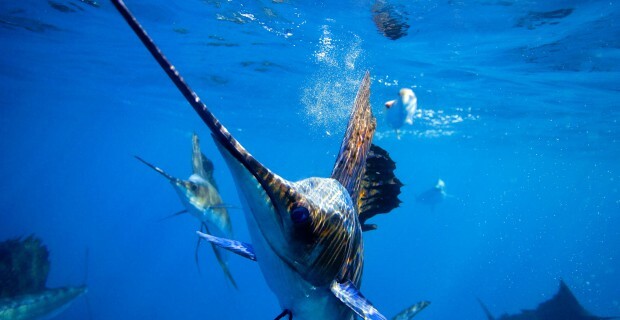 Marlin fishing refers to the type of fishing, which is called the Big Game Fishing. The stakes are high: all or nothing. They use a special type of marlin lures huge size. There are cases when some record size fishes of other types react on these lures. Special spinning rods, reels, fishing line types, special puller are used. Art of catching marlin takes time to get into all the details of this process, and the slightest mistake or omission lead to failure. So Eugene Novozheev for several years polishing his skills, which certainly gives the results. To date, his account is not one marlin caught in Mauritius. Jackson in the days when we do not surf or kitesurf, can spend hours in the ocean on a boat, increasing his level of fishing, or surf in internet for search of new information, collecting the crumbs of the subtleties of fishing for marlin from around the world. Great attention is paid for baits. Each bait of Eugene has its own name, he knows everything about his baits. How they work, how many marlins were caught on each, where they came from. As it turned out, the best bait for catching marlin in Mauritius comes from the U.S. and exclusively handmade by Hawaiian artists. I have been fishing several times before with Jackson in Mauritius. The most memorable moment, when I participated in catching Mahi-mahi, and little by little start to get involved in the process of getting great pleasure from this. Watch the video of Eugene Novozheev and read impressions of Dmitry Evseev about today. Morning 5 February 2014 began for me at 5:40, as at six we had agreed to meet about our kite surf station on the ocean with Eugene and manager of our school Dmitry Korchagin. 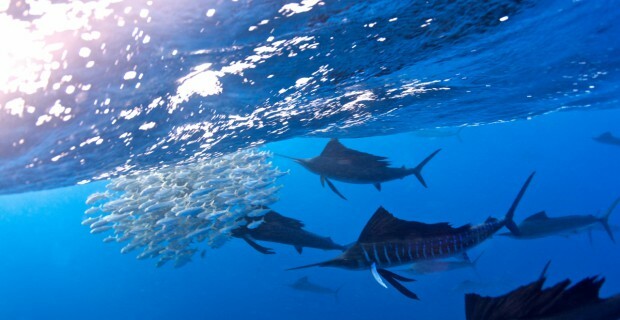 The purpose of fishing is marlin. No other fish is interesting for us today! Big Game Fishing. No compromises. So, we load the boat with 4 spinning reels, each of which is wound up and a half kilometers of special fishing line, a huge gaff and a dimensionless the heavy bag with nozzles, tools and other accessories, the appointment of which I personally do not even guess. Coming by boat from the lagoon, just beyond the reef we start spinning tune. To four spinning fishing line not to confuse with each other, on each side of the boat there are special masts, called “outriggers”. Outrigger removes the line spinning away from the boat for a few meters. Jackson sets for each nozzle on spinnig previously acquainting us with their funny names and telling about each rubber-plastic “fish” her biography. Whatever it may look funny, but the question is, as I understand it, serious! Baits are from about 20 to 50 m from the boat, which moves at a speed strictly 9 knots (about 17 km / h ). “Fishs” does not sink to the depths, and dragging directly on the surface of virtually jet being left by a motor boat. This type of fishing is called trolling. For me, it’s amazing that someone can peck at it. Baits are really very close to the boat, which perfectly audible and visible in the clear water of the Indian Ocean. But Jackson confidently declares: “Marlin like the trace left by boat. He curiously down there. He is the fish.” Okay. Begins the most difficult moment for me in fishing for marlin is waiting. Long tedious waiting. Five hours in a row, we cross the ocean in the vicinity of Mauritius. Maximum distance at which we are moving away from the island in search of marlin, was 25 km. Depth of the ocean there reaches 3.5 km. During this time I managed to sleep, think about life, tired, weary, frustrated and curse all leave again in another dream, which was interrupted by an unusual sound to the ear. So, after five hours of searching, we hear a sharp sound coming from the tip shot off outrigger fishing line and then a loud crash very quickly winds off the line spool. Spinning thus bent in an arc. Does he? And at this moment boat speed increases dramatically. Jackson gives a “gas” as they say. I do not understand why this is, because the hook is clearly someone out there and rapidly storing the fishing line. As it turned out, this is the so-called “sweeps”. Hook should sink his deep, while fish should release a few hundred yards of fishing line, which stands on the gap up to 70 kg. Only in this case will increase your chances of keeping fish, and fishing line breaks. Jackson throws in a few seconds over a harness (a special device to facilitate pulling marlin), triggered enough spinning and we with Dmitry spinning reel others to not confuse the marlin fishing line. Further our roles are distributed as follows: Jackson begins to slowly pull the marlin to the boat, I still have to steer the boat at low speed and the steering her to marlin was always behind us, Dmitry prepares gaff, towel and performs other indications of Jackson. A few minutes later we see their prey. 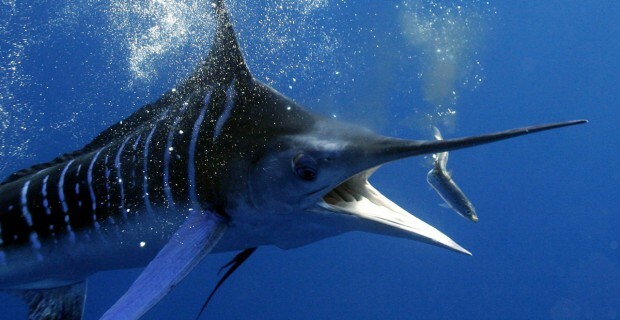 Marlin displayed momentarily on the surface ten meters away from the boat and hides again in the water. We have time to review and assess its size. Big fish! After another ten minutes (although exactly how much time has passed, I can not say, as the perception of space-time at the moment we’ve all been greatly different from everyday life) marlin was already a few meters from the port side of the boat. At this point a second harness dresses Dmitry and takes spinning in their hands. Jackson with a gaff, I’m driving. And when Marlin was already on the surface literally a meter away from us, the fish makes a powerful jump and promptly goes to a depth. Dmitry can not stop at the front of the line on the spool of melting, and we fear the worst, that the line ends and breakage occur. On the boat at this point was something unimaginable. Many bad words… But fortunately, marlin ends its huge growth in the abyss, and little by little we start all over from the beginning. Only now it was much more difficult, as marlin was on a very great depth. Dragging him out of there is very, very difficult, so the guys changed several times to rest. It took us long to dragged it, and at some point Jackson even thought marlin died, so lugging from its depth could be very, very hard. In this case it is likely that it will tear apart the shark. In practice, it had never hapenned to him, but he knew about it. But luckily, after a very long period of time, marlin appeared on the surface again, but this time he is more agile than the first time. Although we felt that he was exhausted, and he didn’t have strength to jerk back into the abyss. Nevertheless, our marlin constantly trying to go under the boat, winding and confusing us. Have to work very hard driving and controlling the speed lever. Blue Marlin vs. Jackson and Co.
At some point, motor boats surge stalls, and we in the nerve attempted to restart it quickly and broke the key. And so begins our Hemingway drama. We are in a dozen kilometers from the coast, we can not start engine of the boat, we hooked marlin, which turns us – wagging as he wants. Jackson in the heart says: “I do not know how we now return to the shore.” (Well, of course, a little other words, very bad words, based on the situation, but the point was just that.) But at this point we realized that we are now not for the world will let this marlin go. As we joined some primitive instinct of hunters. This production will be ours! At any cost! Dmitry intercepts spinning Jackson, who is trying to start the engine using the pliers and God knows what else. We definitely need to start the engine, and even to return to shore. No. Now all the attention is concentrated on the marlin. If fishing line touches a screw or other part of the motor, it is 100% open. So we need to start the engine and straighten the boat so that marlin turned around one of the sides. Fortunately, after a few minutes the engine starts, and we restore the situation. Our marlin slowly begins to lose power, and we once again tightens it with depth to the left side. Jackson spinning, I’m on the motor and Dmitry with gaff. Moment, and a sharp movement gaff glares at his side. The fish starts beating on the boat, but now she’s just ours. 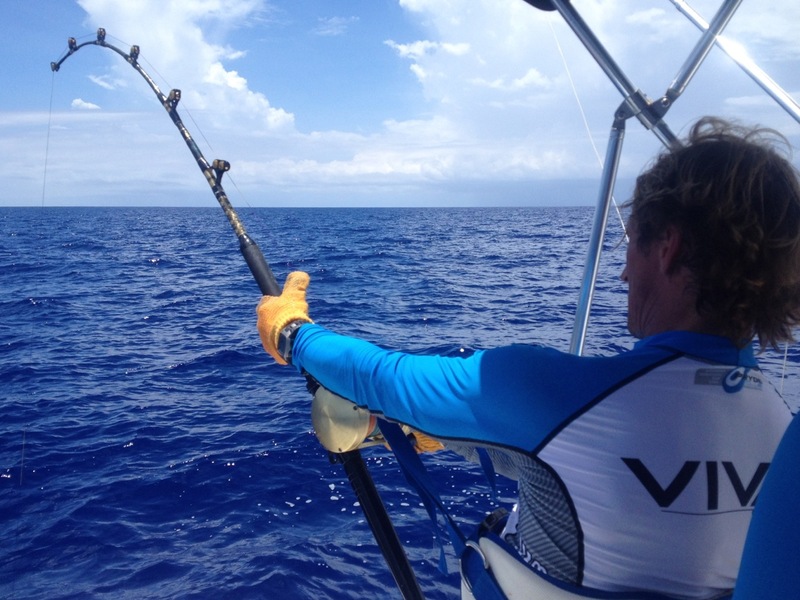 Dmitry pulls her to the side of a boat hook, Jackson grabs a towel and throws on snook marlin, but he did not give Jackson and hand with a towel for a moment is in his mouth. He bites her slightly. Luckily marlin no teeth, and the mouth is a rough surface. Eventually grab prey for sharp nose and pull marlin’s head out of the water. And marlin instantly changes color: turning from black and gray to blue, then back to black. 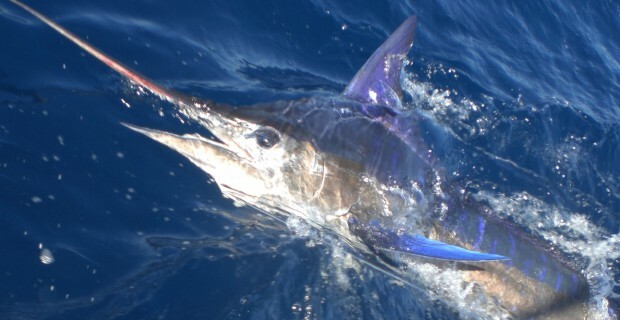 Our blue marlin! Big fish weighing about 80 pounds was caught! By Marlin’s standards, by the way, it’s a small instance. Threesomes, who grasped what we clouds fish into the boat, and exclamations celebrating victory, congratulating each other. Eugene looks at his watch, and solemnly declares: “One hour and a half!”. I can not believe it took so long, but gradually a sense of time retures to us. New to the collection nozzle Jackson American “Antoshka” fully justified, and records in the active first marlin. 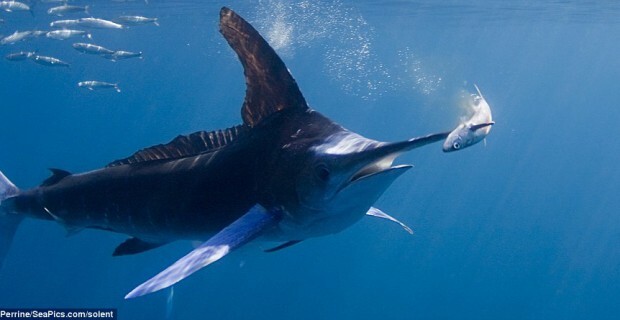 For me, by the way, it was also the first marlin in life, what I was indescribably happy. Time to return to shore. Traditionally the fishermen who caught the marlin should hang a red flag on the outrigger that we do immediately and proudly back into the lagoon. Fishermen from passing boats sign language ask us about the size of a marli, and of course, congratulations. I jump out of the boat and hurried to the SUP Safari, which I wad already half an hour late due to the unexpectedly prolonged fishing. Guys are to divide the fish. My share was the piece of impressive size that I with the sense of accomplishment husband-hunter brought to my family in the evening. The eldest son, heard that we were fishing today without him, became very upset. Hearing that we caught the marlin brought him into depression. He shut himself in his room, and said that he didn’t want to see anyone. And stupid school, because he did not go on a fishing trip today. But fortunately, levies a sense of outrage, curiosity began to ask about all the details of today’s fishing. 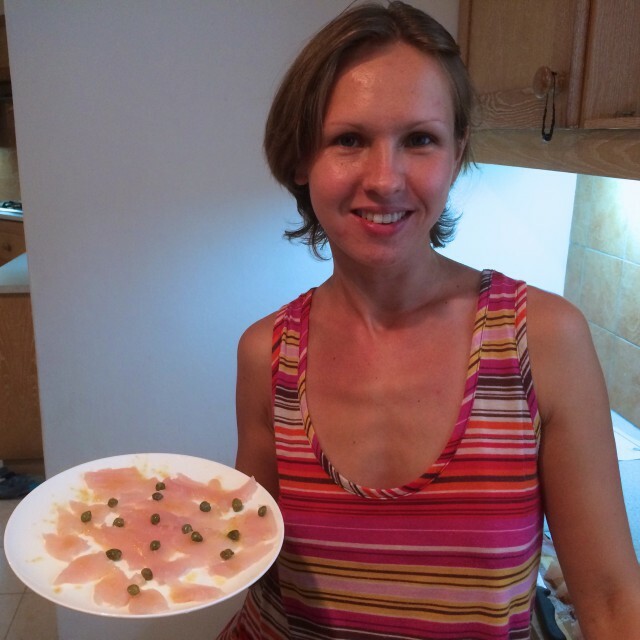 For dinner, the whole family was treated to fresh marlin carpaccio. Yum tasty! So now, in addition to traditional sports for me in Mauritius like as surfing, kitesurfing, windsurfing and SUP, I’ll catch marlins. After the season is in full swing! 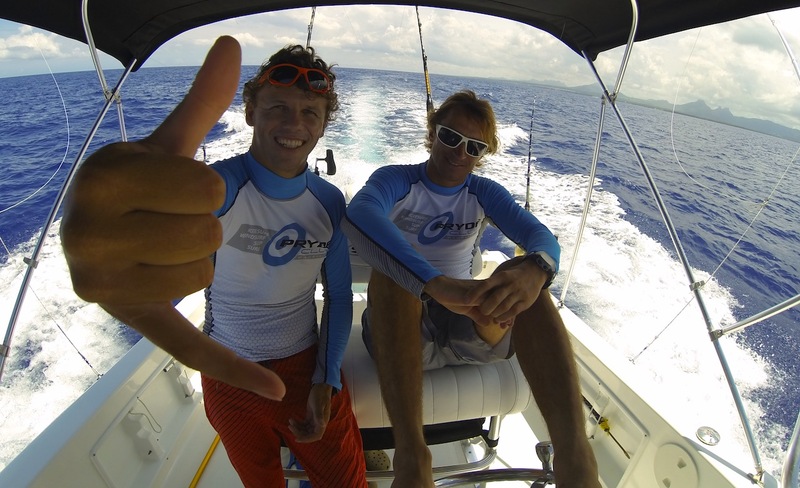 Welcome to Mauritius in kite surf school Pryde Club!